This article first appeared on the NLGN blog. The local elections earlier this month saw several city regions elect first time Metro Mayors. The turnout in places like Manchester (29%), where Andy Burnham was elected, was pretty good for a plebiscite on a newly devolved role. In the past, votes have fallen as low as 15% with contests like the Police and Crime Commissioners elections. This relates to a deeper issue with communicating devolution. While politicians are great at talking in big picture terms about the localism agenda, there’s often too little meaningful focus on the basics of what’s actually going to change. People are told their area will have “powers to shape their own destiny”, for instance – without knowing precisely which powers, how it worked before and how it will work now. They hear about “realising the potential of the area” but aren’t told why – without significant extra funding – closer to home means better. What can the new Mayor do that the council leaders who were there before couldn’t, they wonder? How will this actually affect me? As a result, devolution can seem both vague and overly-technical at the same time; a mixture of political warm words and funding minutiae, with little to bridge the gap. While residents can see little about devolution with which they violently disagree, they don’t get half as excited as their representatives would like! 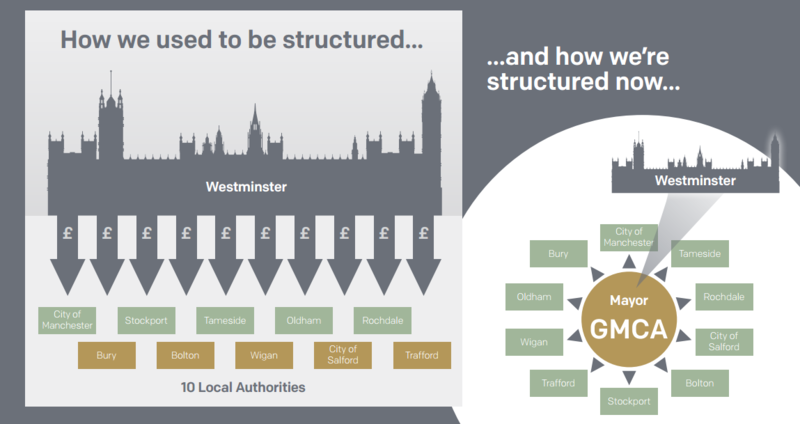 We set out to address this for our LGA New Conversations project, part of which involved a pilot project with the newly formed Greater Manchester Combined Authority (GMCA), in the run up to the Mayoral elections. The aim was to give local councillors a resource pack, helping them to communicate, as they went about their daily business, what the GMCA devolution for the region would mean. We included things like a set of infographics, providing simple visualisations of what would change – the sorts of things that people could draw on an envelope for a colleague, or explain to a relative using the salt and pepper shakers (see top). Likewise, we provided a simple timeline, and a Q&A with everyday examples of the GMCA impact. We also created a ‘message house’ of sorts – but one based not on blue skies visions but on everyday examples. The aim was to provide the outline the questions that would need to be answered to make devolution clear, tangible and personally relevant. You can read the pilot here and see all the resources in the pack here. None of them are revolutionary in terms of wording or design, but what they demonstrated, during the project, was the value of meeting people where they are. On other constitutional questions, many of the same principles surely apply. Only once people are on the same page – only once there’s a set of basics that everyone can agree on – can politicians start to deliver their broad, aspirational pitch. There’s an important point to be made about the councillor role here, too. Over the course of the many projects we’ve run with local authorities, we have been struck again and again by how innovative and effective councillors were in engaging with communities. But we have also noticed how little practical support they got in some places, and how underutilised many were, given the vital role they play as the front line of engagement. This was especially true with backbench and opposition councillors, who are sometimes left at the margins. By giving local members a neat, consistent, set of bread and butter resources – which they could tailor to their own wards – explaining the nuts and bolts became a whole lot easier, giving politicians more time to sketch out the bigger picture. In other words, the more the straightforward basics are widely understood, the more whitewash comms can be dispensed with, and genuine engagement and involvement can start to take place.